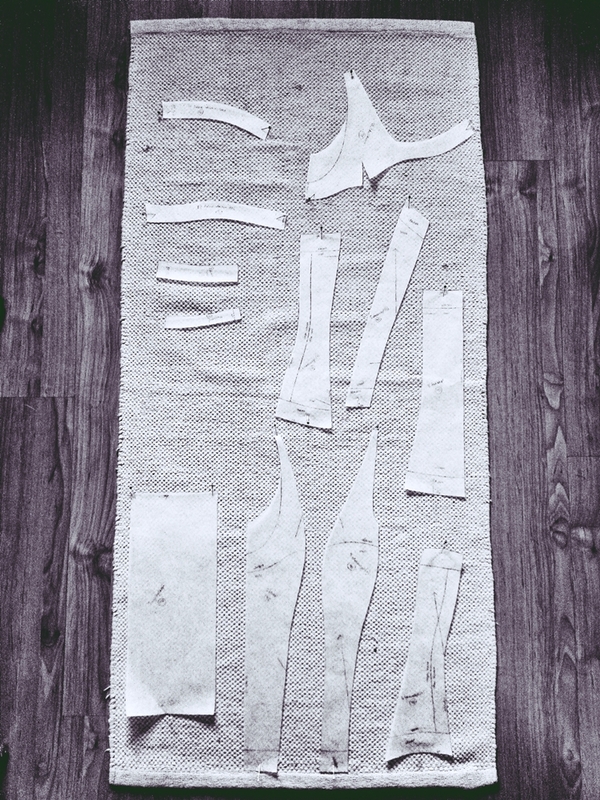 This is where it all started – the patterns for the top part of the dress. 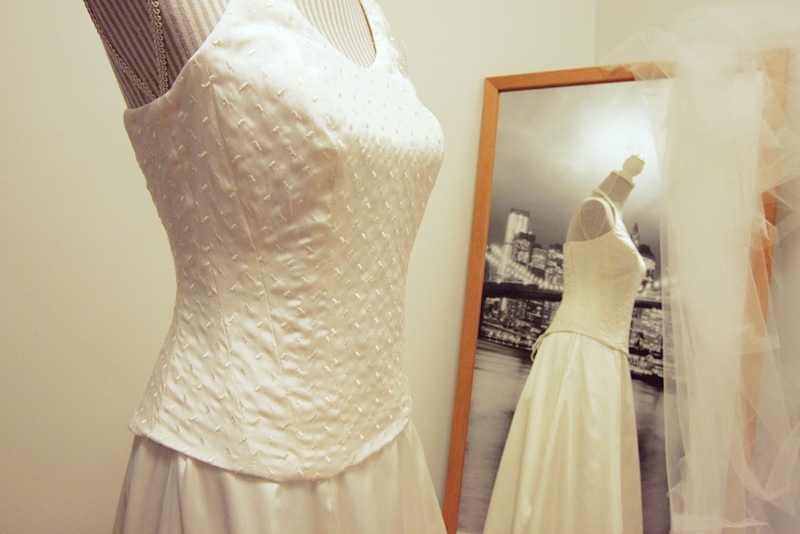 When choosing the model for the wedding dress I advised my sister to think sustainably (duh!) We picked a 2-piece dress so that it would be easier for her to combine both pieces with the rest of her clothing later on. The model was simple and elegant – my sister is the sporty type and definitely not into ruffles and stuff. The narrow-lined top will be a nice party garment in the future, combined to skinny pants and high heels, for example. When we started planning for the dress my sister had just had a baby (my very handsome nephew!) 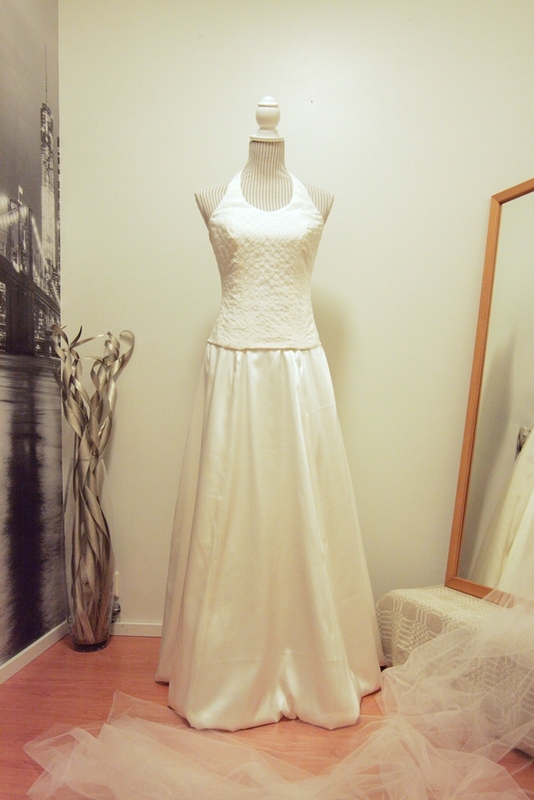 so we needed a top that was going to be adjustable, as she was most likely going to lose weight before the wedding. 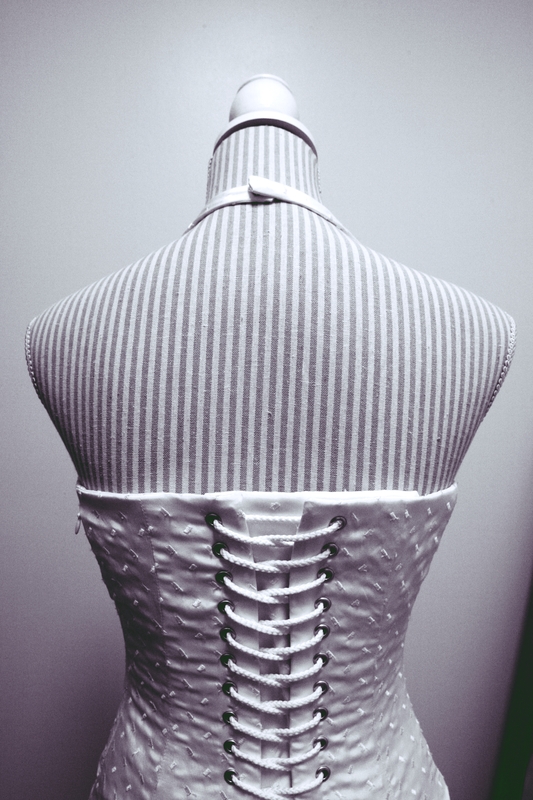 The bodice was made of 3 different layers, there were about 50 pieces of fabric altogether. So it wasn’t exactly an overnight project! Before I had the courage to start cutting the expensive silk I made a muslin, which is a fitting piece of the same garment. For the muslin I used thrifted curtains. 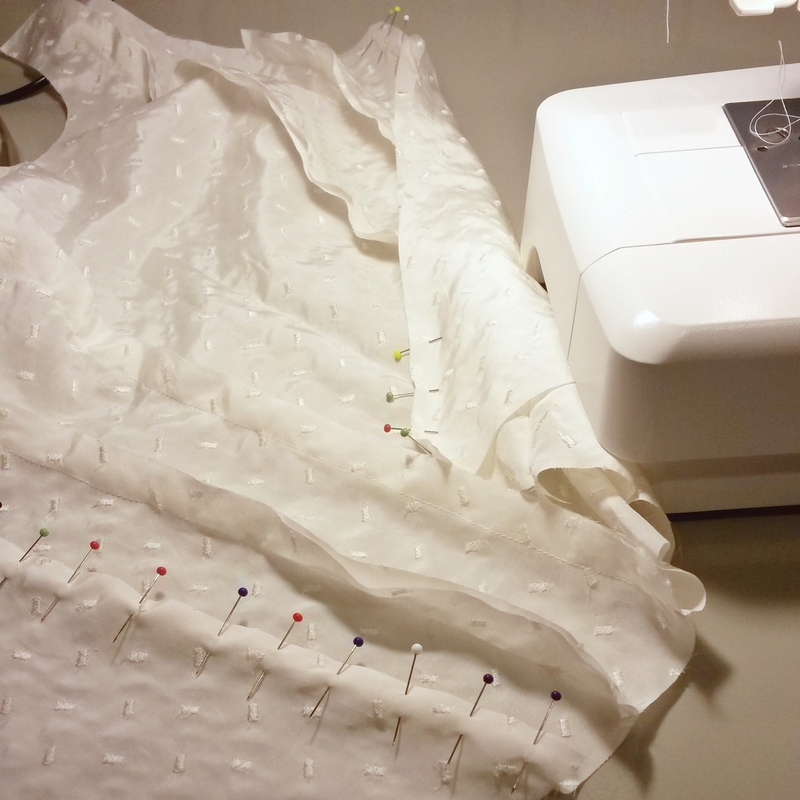 The muslin for the fitting. At this point I want to make it clear I did not draft these patterns myself. 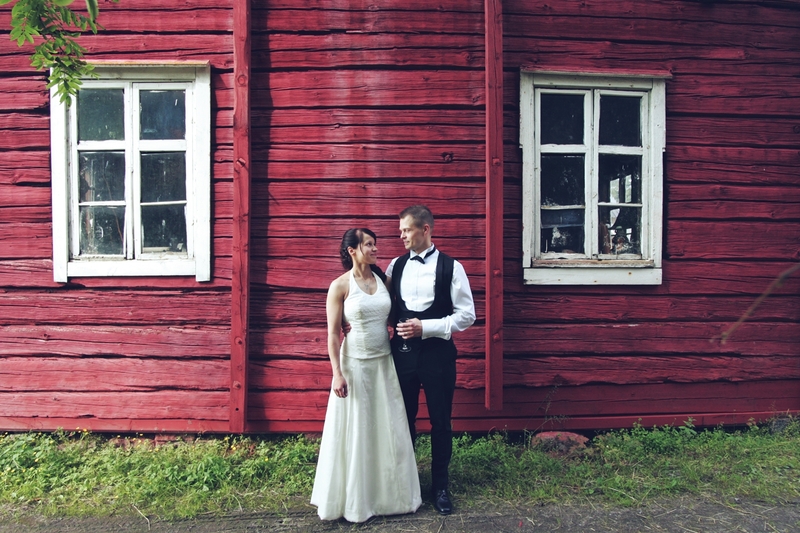 We were on a very tight schedule and there is no way I could have finished the wedding dress on time had I have started from scratch with the patterns. I combined two commercial patterns that I found in my stash of old sewing magazines. It worked out really well, as the top part did not need any alterations at all! I only changed the skirt; made it shorter and narrower, as my sister wanted. Due to my years of experience in industrial sewing I really hate using pins. But working with light weight silk (and such an important garment) I had to give in and use quite a lot of them! I used plastic boning and attached silicone covers by hand to both ends of each bone strip. 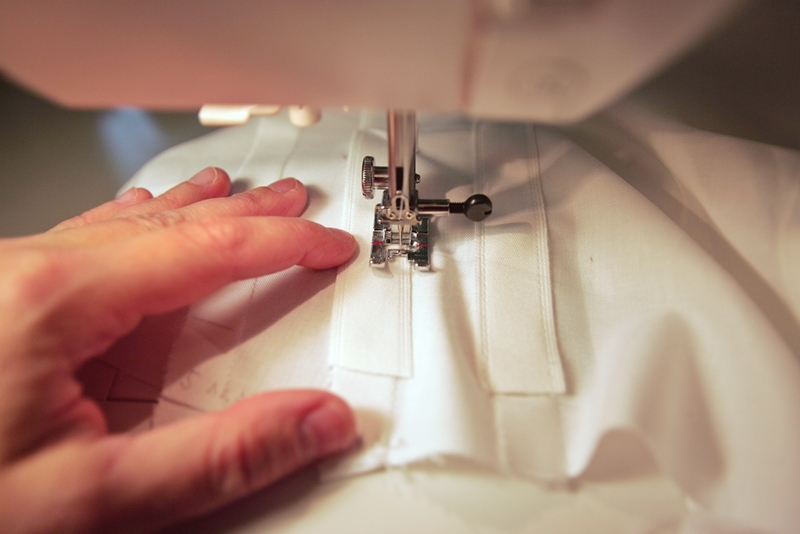 Sewing the boning casing onto every seam of the top. I will spare you the details of the foul language I used when I found out in the middle of sewing the top that there was a mistake in the commercial pattern… Fortunately I only had to cut 2 new pieces but it was overwhelming at 11pm! I’m sure every seamstress can relate to that. So I just went to bed and started fresh the next morning. 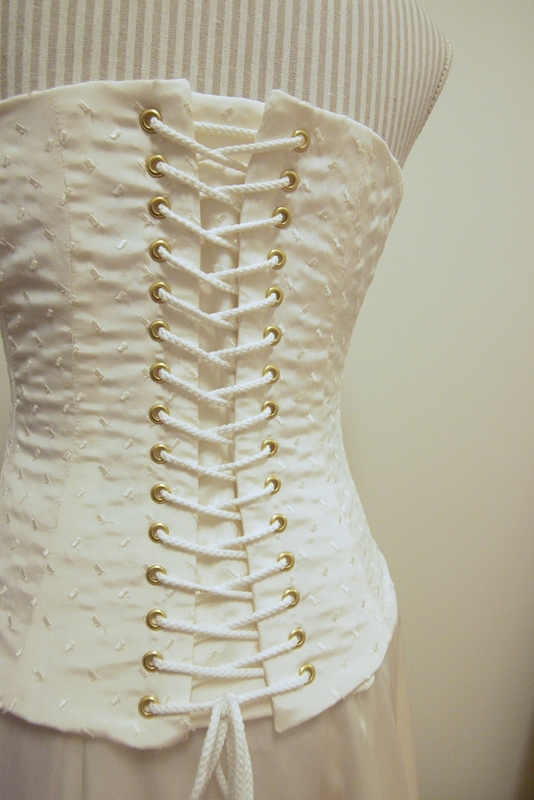 There were 30 eyelets in the back of the bodice. 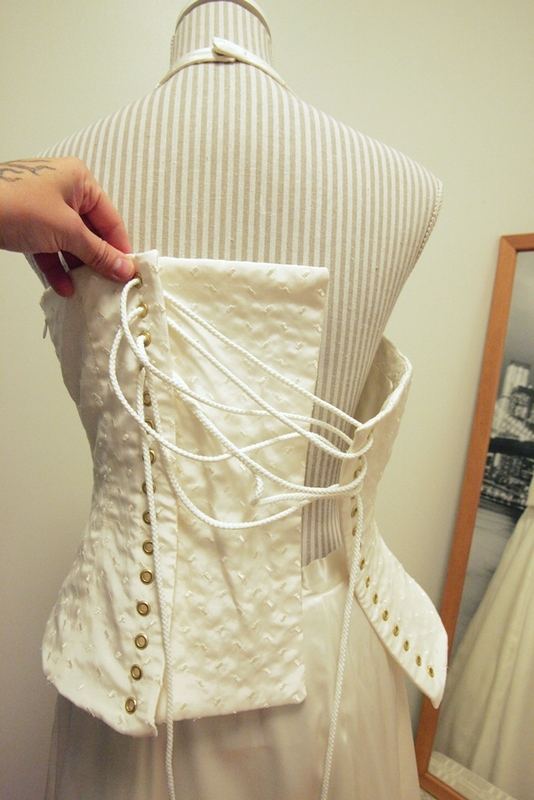 Without a doubt the scariest part of making this wedding dress was to start pounding 30 holes in the back of the bodice. I mean, so scary I had to measure everything 3 times and then take 15 minutes just to look at it and build up courage. But once I got over the fear of ruining the dress it was a lot of fun, actually! The inside and 3rd layer of the bodice. As you can see, there are a lot of pieces! 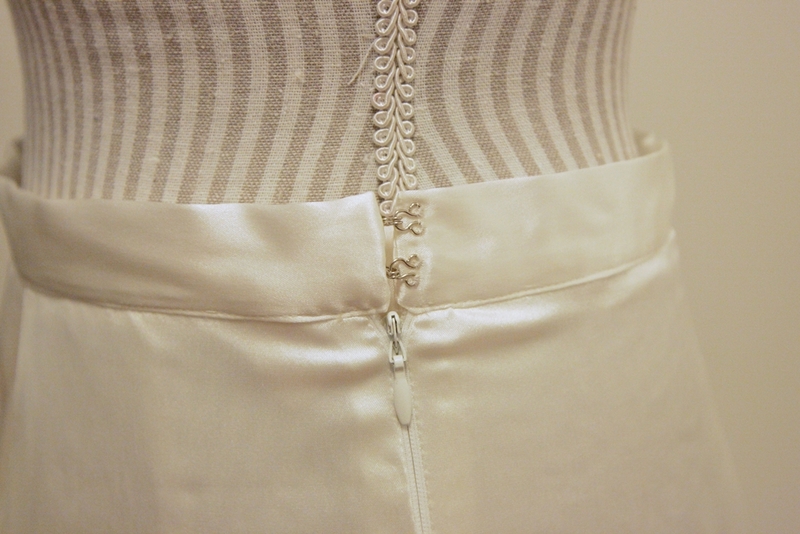 The inside flap in the back of the bodice gives plenty of room for adjustment. 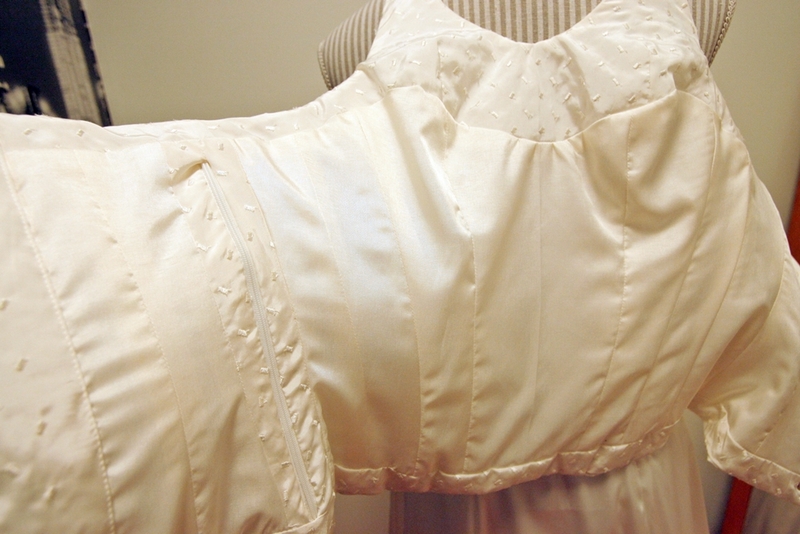 For the wedding day the polyester cord in the back was replaced with silk ribbon. There is a hidden zipper on the left side but to be honest with you, there was not much use of it. 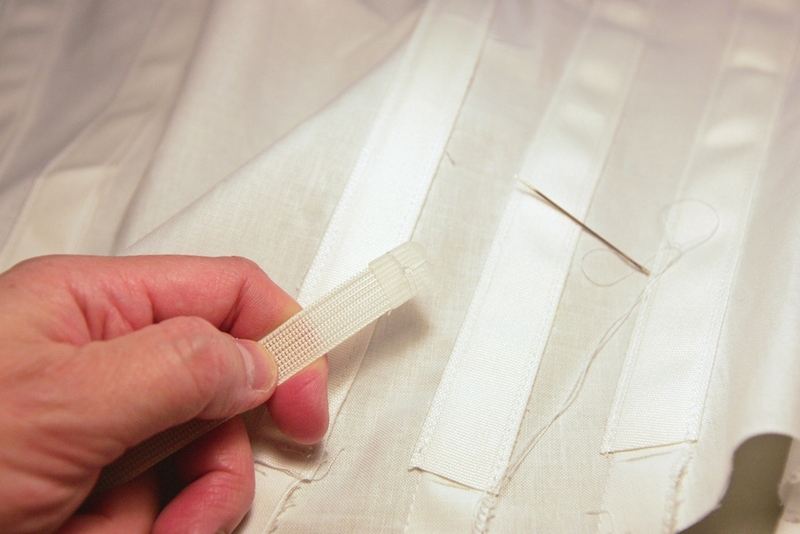 Whenever you dress or undress the bodice the ribbon has to be loosened almost all the way up, anyway. I used a lot less tulle than what the original patterns instructed. My sister didn’t want the dress to be too fluffy. The silk skirt was a fairly simple one with cotton lining. 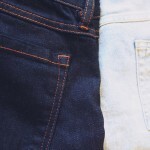 I shortened and narrowed it quite a bit – both my sister and I prefer simple lines instead of large hems. 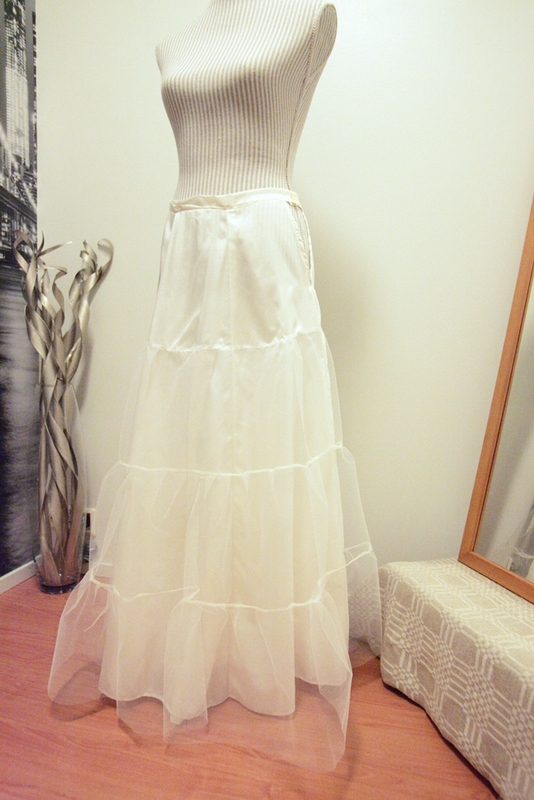 I made a separate underskirt with a layer of tulle to give the hem some nice drape and flow. All the little details such as hooks, buttons and snaps were sewn by hand. The inside linings were attached to the hidden zippers also by hand. Time consuming, yes – but gives you the neatest results. And how is this dress sustainable? Well, for several reasons. 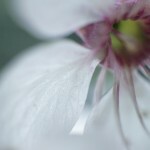 First of all, it’s handmade very carefully and with the right care will last for years, or decades even. It’s a 2 piece dress so you can wear the bodice and the skirt separately, combined to other pieces of clothing, without it looking like a wedding dress. It’s made of silk so it can be dyed if wanted. By simply changing a bright colored ribbon to the back of the bodice it will work as a party outfit. The skirt is a simple model and can be shortened and/or altered in several ways. Making this wedding dress has really made me think about not only the sustainable, but also the ethical factors in the clothing industry. If you can order a wedding dress online for less than $200, how much will the seamstress actually make per dress? Will the dress last for as long as this one will? Can you use it for different occasions year after year and it will still look good? Will you know who exactly made the dress and in what conditions? 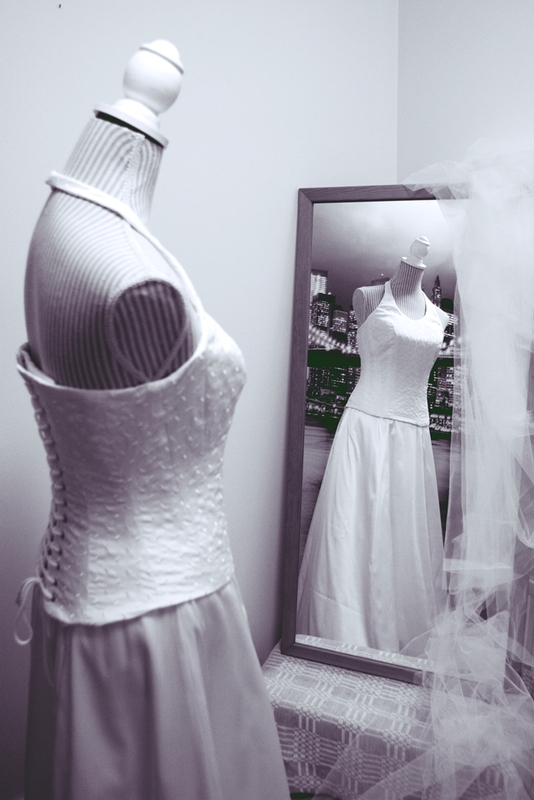 These things are all worth considering, besides only the price of the wedding dress. 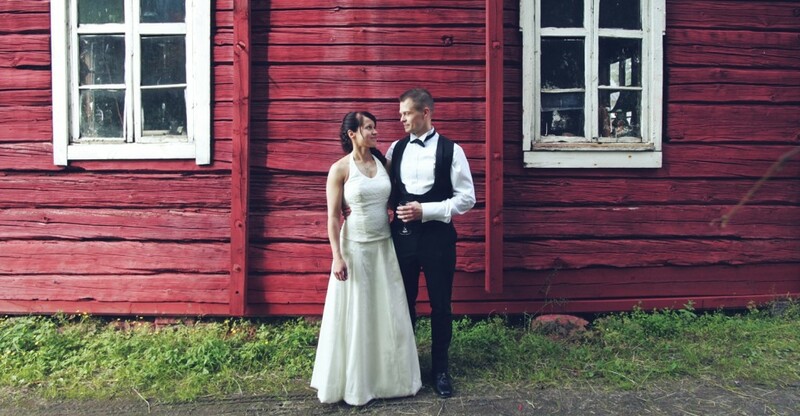 Congratulations once more, Kaisa & Petri! 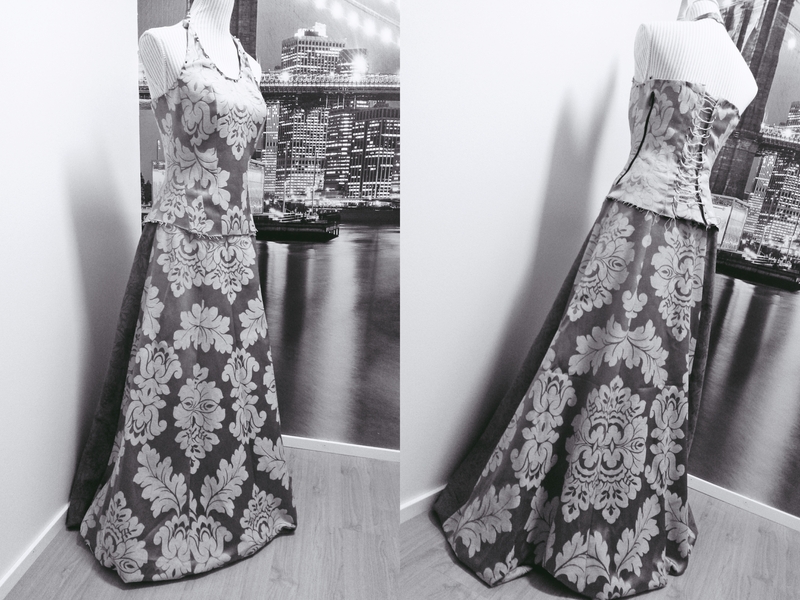 This entry was posted in Clothing, Photography, Sewing and tagged 2 Piece Wedding Dress, Bodice, Handmade Wedding Dress, Silk, Skirt, Sustainable Wedding Dress, wedding dress. Bookmark the permalink.